I was watching this video by My Pale Skin not too long ago and I immediately remembered how it felt dealing with acne. And how it still feels to battle hormonal breakouts that seem to pop out of nowhere (seriously, who knows when these decide to pop up?!) and feel insecure. Because whether you're in high school or enjoying the office life: it's not easy. From feeling insecure during meetings to having a face that literally hurts all day through, acne is a tough one to deal with. The video made me tear up and even though my acne luckily limits itself to the lower half of my face, I learned how to deal with it over the years and I feel like I have a pretty good idea of what does and doesn't work for me. Even though it's a very personal thing and this might not be your saviour routine, I want to share as you might discover a tip or product or two..
My acne has dramatically improved since I started double cleansing. Sometimes I get all lazy and skip the double cleanse, but when I do this for too long I quickly regret it as my face quickly starts breaking out again. On a regular evening I will remove my makeup with micellar water and a bi-phase eye makeup remover first and then skip to double cleansing: I go in with an oil cleanser first and then follow up with a gel cleanser. I like the DHC cleansing oils, but you can find other great oils at Shu Uemura, L'Occitane or The Body Shop. The gel I am using right now is the Anti-Blemish Solutions cleansing gel by Clinique which is an awesome recent launch: formulated with salicylic acid this'll cleanse, disinfect but won't dry out your skin too much. Afterwards I go in with two toners: the first one is the infamous Eau Précieuse toner that is available in pharmacies in Europe, followed by the Toning Lotion with Iris by Clarins. Both of these are definite re-buys that I'll keep repurchasing whenever I run out. 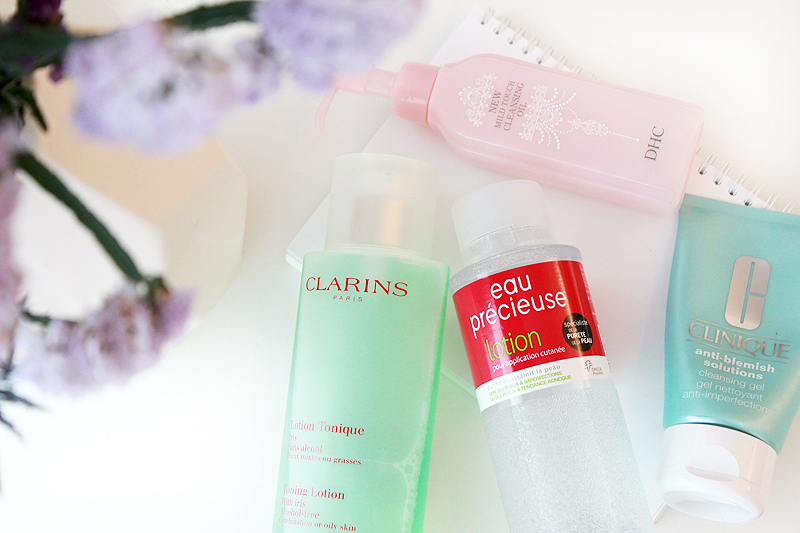 Eau Précieuse is a purifying toner formulated with salicylic acid and boric acid, while the lotion by Clarins is a more gentle toner with beneficial purifying ingredients as well as soothing aloe vera that makes me skin feel ah-mazing and ready for moisturiser. Then it's time to go on with moisturiser. 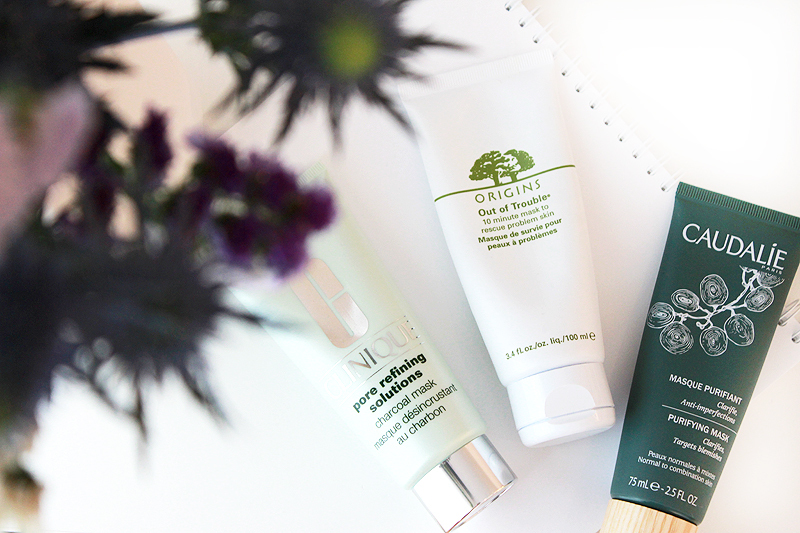 I like using moisturisers that aren't too heavy, like lotions or gels. I really like Kiehl's Ultra Facial Oil-Free Lotion, it's the perfect moisturiser for acne prone skin and it's very budget friendly too. Recently I've also been trying Melvita Apicosma Soothing Skin Cream and have been loving this one too, even though it's a cream within a range meant for drier skin I find that it's very light-weight and it hasn't upset my skin. It's also well worth noting that this cream is sterilised and therefor doesn't use any preservatives: you can keep it for up to three months. This means all bacteria and other harmful organisms stand no chance within the bottle, while all the beneficial active ingredients can work their best. Awesome! Another great moisturiser to note is the Avène Cleanance Hydra moisturiser, meant to be used when your skin is suffering dryness after agressive acne treatments. If you can relate when I tell you about feeling like your skin is going to peel off when using a dermatologist prescribed treatment you should look into this one. At night I am quite the fan of Philosophy's Hope In A Jar Night: a moisturiser for normal skin that contains glycolic acid. I don't use too much as it's quite a thick cream, but I really like the exfoliating properties. However when I'm using other acne treatments at night adding this night cream on top would be overdoing it, so in those cases I just go back in with my regular moisturiser. Finally it's important to use SPF during the day and while a lot of facial sunscreens can cause spots, there are a few that are formulated to be more gentle on your skin. 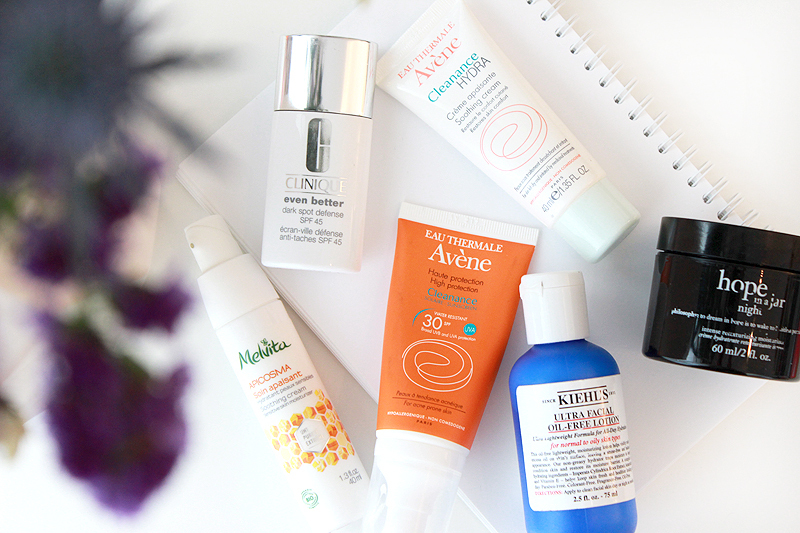 Avène Cleanance Sunscreen with SPF30 is a great option, but I also really like Clinique's Even Better Dark Spot Defence with SPF45 as it's so light-weight. 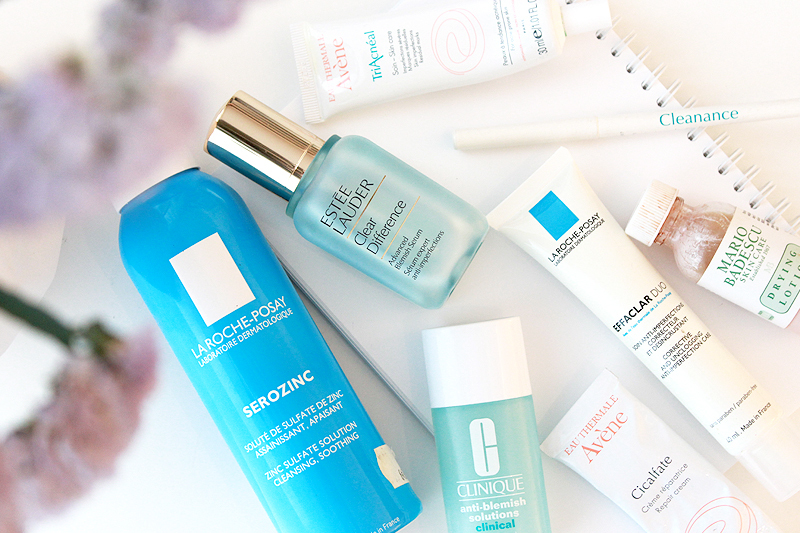 The most important key to my acne routine probably is using the right type of treatments at the right time. When I'm not experiencing any bad breakouts and the coast is relatively clear, I use the Estée Lauder Clear Difference Advanced Blemish Serum underneath my moisturiser. It's nothing I'd use when battling acne or severe breakouts as the percentage of salicylic acid used in this serum is lower than what I'm used to, but it's a good serum to use during calmer times or when you're just trying to fight off the occasional pimple. When times are tough and my skin is breaking out, I use different products for different stages of the breakout. When I suspect something's going on and I'm trying to keep it at bay I will use La Roche-Posay's Effaclar Duo instead of my regular moisturiser on the area where the breakout is happening. You can continue to use this throughout the whole breakout, it's also fine to use underneath makeup. On active breakouts I really like using Clinique's Anti-Blemish Solutions Clinal Clearing Gel as well, although mostly on makeup free days because I don't like how it feels underneath makeup. When I'm on the go and my acne flares up out of nowhere, I'll use the Avène Cleanance Spot Treatment stick to attack the pimples as soon as possible. 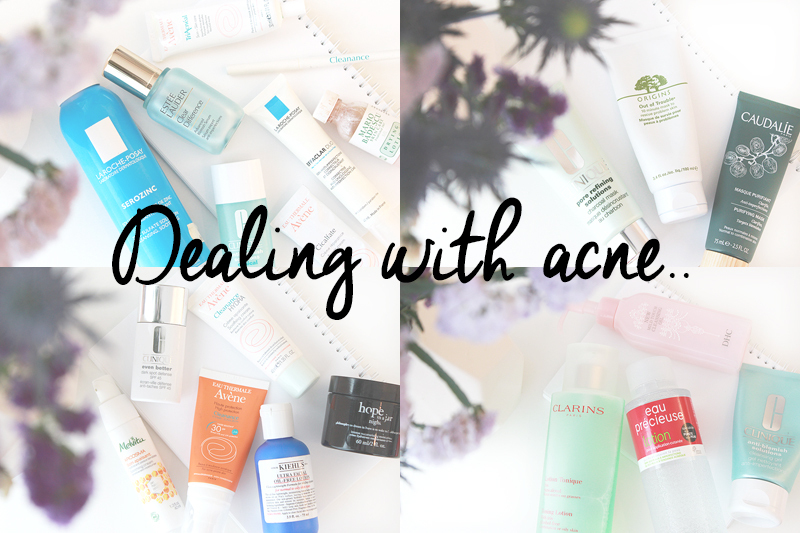 On big painful active pimples with a white head (the worst!) I use the Mario Badescu Drying Lotion during night time as this will dry it out in no time and dramatically reduces the size overnight. When the breakout isn't very active anymore and I'm more concerned about preventing or reducing scarring and getting rid of those pesky dry pimples, I'll use Avène's Triacnéal treatment on the areas that need treatment. This is an absolute holy grail product that everyone suffering with acne should have! It goes without saying that you really shouldn't be popping any spots as it can make everything a lot worse, but when you can't help yourself doing it my biggest advice is to disinfect the area as soon as possible (I use a disinfectant spray from the pharmacy) and follow up with Avène's Cicalfate Repair Cream which will speed up the healing process. And last but not least I really like La Roche-Posay's Serozinc spray, this is great to use right before applying your moisturiser or to refresh your face throughout the day. 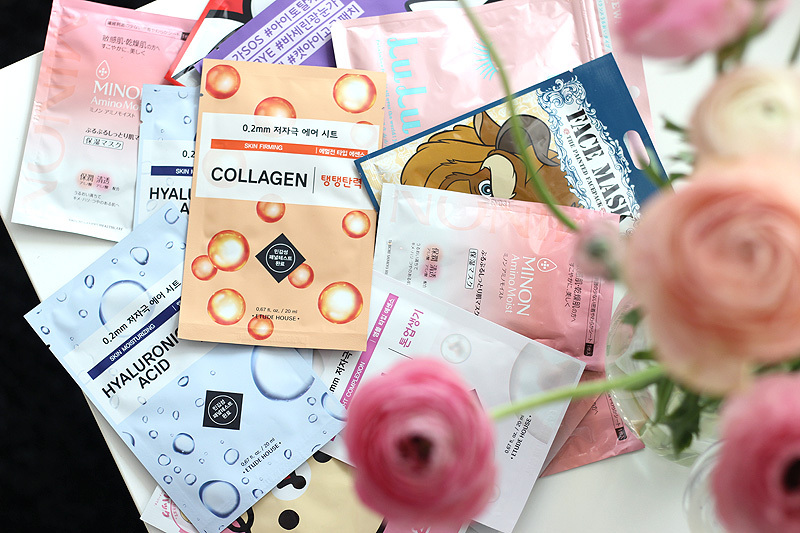 Finally I believe that every good acne routine needs a good mask. A good purifying mask will draw out excess oil from your skin and will deep cleanse for a clarifying effect. Clinique's Pore Refining Solutions Charcoal Mask is a newbie on the block and will absorb oil and impurities thanks to the charcoal powder and mineral clay in the formula. Origins' Out Of Trouble mask is an old favourite and is formulated with Zinc Oxide, Sulfur, Camphor & Salicylic Acid which will take away excess oil, deep cleanse and calm skin that is acting up. Another relatively new mask I've been loving is Caudalie's Purifying Mask that is formulated with white clay, zinc and a blend of essential oils to cleanse and calm skin suffering from impurities. Another mask I should highly recommend is the Avène Cleanance Mask which is my absolute favourite to calm down breakouts. I have run out though and since I have these three laying around I can't justify repurchasing it just now, but I definitely will in the future. 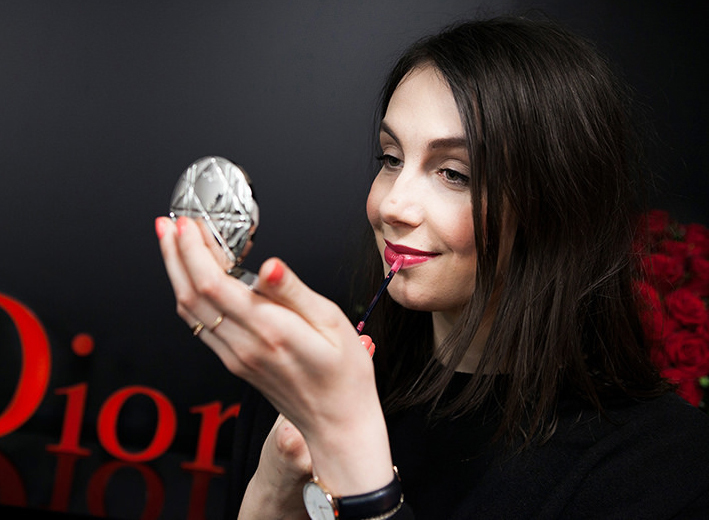 Two extra tips that are non-product related but very essential to keeping breakouts at bay are to spot cleanse your makeup brushes every single morning with a bacteria killing spray cleanser (I use the Sephora Daily Makeup Brush Cleaner), this will kill off any bacteria sitting in your brushes that are waiting to cause a scene on your skin. Next to this it's also important to wash your pillow case as often as possible to prevent oils, skin debris and bacteria from taking over problem areas on your skin at night. It might seem a lot of extra work but in reality this takes five minutes and will result in a huge improvement of your skin! I bought a few extra sets of pillow cases to make this a feasible routine, that way I don't have to put in more washes than before and I still get to change cases regularly. I hope I helped you a little with this article - I know battling acne is tough but don't worry: you'll get there. My skin has dramatically improved over the past year and I believe it's because of my strict skin care regimen. If things get too tough and it seems like nothing is helping it's always the best idea to visit your dermatologist. I have been there too and with two prescribed meds (an antibiotic ointment and a very active exfoliating cream) I have battled through some of the hardest acne times. These are very invasive on your skin and therefor not suitable to be incorporated in a daily routine, but when you've lost all hope this is nothing to be afraid of. And remember: perfection isn't real and you are beautiful. Don't let anyone tell you differently, not even yourself.